Limitless is currently in the midst of a 50/50 positive-negative war on Rotten Tomatoes. After watching this movie, I thought for sure it would be more positive than it is. It’s really just fun on so many levels, from the frenetic direction by Burger to the surprise script from Mrs. Doubtfire/Hairspray/Heartbreak Kid/Look Who’s Talking Now scribe Leslie Dixon. It’s kind of Bruce Almighty via drugs. 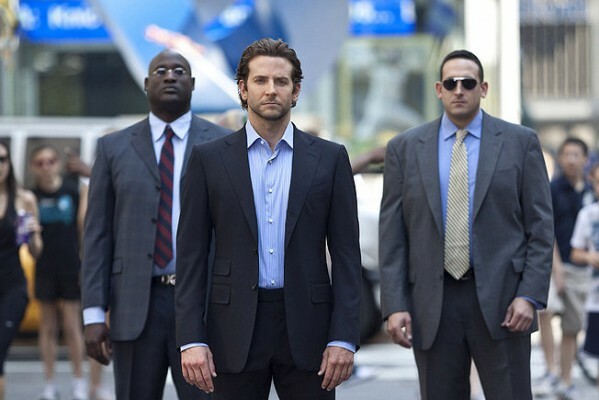 Eddie Morra (Bradley Cooper) is a struggling writer who can’t fulfill his book contract. He hasn’t written any pages, and his girlfriend Lindy (Abbie Cornish) is leaving him. Morra runs into his ex-brother-in-law Vernon (Johnny Whitworth), who gets him to try this drug that turns a 15% functioning mind into a 100% functioning mind. Morra is at the height of his observation, he finishes his book in days, and soon after he’s learning languages and finding patterns in the stock market. He makes millions, which captures the attention of a Wall Street shark by the name of Carl Van Loon (Robert De Niro), who wants to use Morra’s abilities to secure a multi-million dollar merger. Morra has several people chasing him, one is a Russian mob guy to whom he owes money, the other is a henchman from another Wall Street heavy. And oh yeah, the drug is a bit dangerous, too. His ex-wife Melissa (Anna Friel) fills him in on the side-effects. But the side-effects, while causing some plot complications here and there, are really not that important. The movie is about the what-if effects of a wonder drug like this, and when we see Morra getting into situations he normally would have no business being in and acting like a pro, the movie is tremendously fun. I almost wish this movie didn’t have any real conflict. It might have been irresponsible to do so, championing drugs in such a way, but it would have allowed the movie to be free to go crazy. Will Hunting as an adult, on drugs. Cooper is a likable actor, he got his big boost with The Hangover and has been cashing in, many times in huge-cast movies like Valentine’s Day, He’s Just Not That Into You, and New York, I Love You. This is a good role for him. Robert De Niro isn’t quite “back,” and this is really just a cameo when it comes down to it, but at least he’s not embarrassing himself this time. This is just a fun movie, perhaps not for everyone, but I dug it.